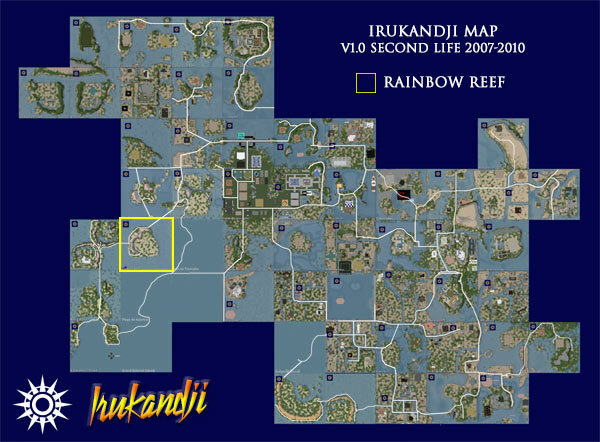 Rainbow Reef is a significant conduit for the Trans Irukandji Causeway in the region, which traverses the sim from the north at Palu Island to Sunset Shoals in the west. Rainbow Reef has one major homestead property on its central atoll, which was occupied throughout the island's life. The terrain of Rainbow Reef was hand terraformed using Minoan Atolls as its template. Neighbouring islands were Palu Island, Aquitaine Bay, Baie de Triomphe, Plage de Kalamat, New Batavia, and Sunset Shoals. Regrettably, no photographs have come to light of Rainbow Reef. If you happened to have visited the region and have photos to share, please let me know in the comment section below.